There is the wonderful saying that life often begins when we get out of our own way? I have found when we allow ourselves to be present, when we acknowledge the answers and when we trust the bigger picture, we move from being in the way, to being on our way. A few years ago I just couldn’t get out of my own way, to allow anything into my life except heartbreak, depression, bad health and toxic relationships. Life is an amazing journey when you awaken and actively participate in the discovery of you. Human beings are creatures of evolution, of betterment, change and growth and this is what drives us along life’s great expedition. However to get to that point of change we often have to go through some tough periods, some heartbreaking tales, or some unwell times. 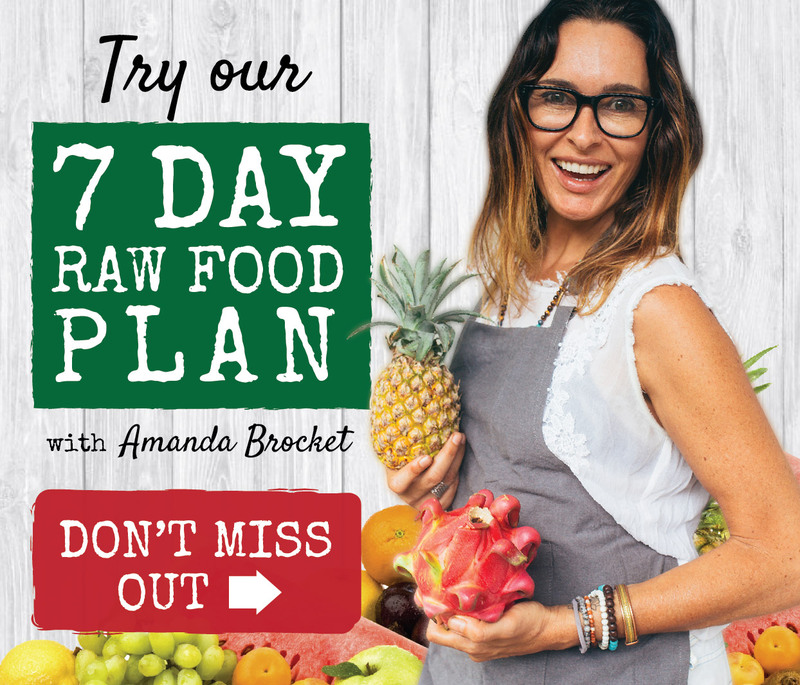 Amanda’s Raw food revolution began simply as a need to heal herself and live a better life and her self-journey has led to many other discoveries. She has healed her dietary health, she has found a new passion and purpose with The Raw Food Kitchen but what I think is the most important part of all, is her discovery of her inner health. Similarly as within my own journey life gave me so much more than just an answer for happiness. I was to learn that inner happiness was already within me and in those realisations life shared with me some fulfilling and exciting adventures. We are all at various intersections of our own unique paths, some of us are questioning, some of us are waking up and some of us are remembering. These life voyages are not often easy and there is work to be done and truths to sit with but the knowledge in the answers you receive when you allow it, is breathtaking. Being happy is a choice, being well and healthy is a choice also, it’s a conscious shift in allowing the present moment to be your powerful moment of awareness and clarity. The Happiness Movement that I’m creating is a mindful movement; it is an acceptance of happiness as our natural state of being! I do not believe we need to go and search for it, or purchase it or hold it too tightly. When I got out of my own way I was able to hear and learn this and my desire is to help you do the same. So what are you allowing to pile up on you that may be deafening your natural happiness? Could it be responsibilities, work pressures, insecurities, family dramas, stress? We all need a reminder, some motivation or a change of perspective sometimes, so here are my top 5 ways to remember your own inner happiness. Take a few deep breaths and feel the power of the present moment, remember that all your power lies within the now. Be still & be grateful. Stillness evokes a sense of peace and calm and gratefulness puts you within a higher energy field and in a better mood. Smile more – This is a must, smiling inserts happiness even if you don’t feel happy at the time and don’t save the smile for just you share with everyone you meet. Be kind- such a simple analogy but sometimes it’s the simple things that get lost in our days of ‘busyness’ as we prioritise unnecessary things based on superficial value. Be kind to yourself, your family, and your friends, with all whom you meet. It will add value to your life and the lives of others when you spread and share a little kindness. Find your passion and leave a positive imprint. Do what you love, uncover your desires, engage in life and all its beauty by utilising the gifts you have and the purpose that is yours and yours alone. Think about the imprint you wish to leave and the real journey you wish to have. The “I Wish You Happiness” Tour has just been announced for late March 2014 with Amanda and me aligning with a group of amazing women wishing to inform, inspire and motivate you …. Click to my website www.elisebradfield.com now for more light, love and tips on happiness and stay tuned in February for more details about this fabulous event and to purchase tickets. Did Elise’s story resonate with you? If so tell us what easy steps you have used in your life to help bring you clarity and happiness into your everyday? We would love to hear from you in the comments section below!